It is the pleasure of Colorado School of Mines and the Mines Alumni Association to formally introduce and welcome the new Executive Director of the Alumni Association, Mines alumnus Damian Friend. To get to know Damian and share a bit of his story, Mines Magazine sat down with him for an informal discussion about his time at Mines and his new role. What did you enjoy most about being a Mines student? My favorite courses were in geology. I really enjoyed the outdoors, so the geology field trips and learning about the Earth was great. I liked the spirit on campus, and I was involved in a lot of different things. The courses were hard, but I found that in my lifetime, those that really tested me and some of the hardest professors were some of the ones that I ended up appreciating the most, because it drew the best out of me. And I think that’s what Mines did—it really drew the best out of me. Were you involved in any extracurricular activities as a student? I was involved in cross country and track and indoor and outdoor track—I think I lettered five times in sports when I was here. I was the president of Blue Key my senior year, and I was in Sigma Gamma Epsilon. I was also sports editor of The Oredigger for one semester. What was the most valuable thing you gained from your time at Mines? Learning how to be resilient in times of failure and to know that if you don’t have an answer to something, Mines will teach you how to find an answer. And just being as good as you can be as an engineer. You can’t allow too many mistakes in engineering—depending on what you’re doing—so I think Mines really teaches you how to do things right. What advice would you have for incoming students or current students? Never give up. If Damian can graduate, you can graduate. What made you want to come back to Mines and be involved with the alumni association? I was really looking for an opportunity where I could make an impact—a challenging job that was impactful, that had a purpose, something larger than myself and that could really add value to what I would be doing. And this position has all of those ingredients. What a great place—I started here, and now I’m back. What is one of the best qualities of a Mines alumnus? They’re very motivated. They’re very intelligent, driven and extremely successful. Oftentimes I find them to be very giving, just out of their own desire to give back to Mines. 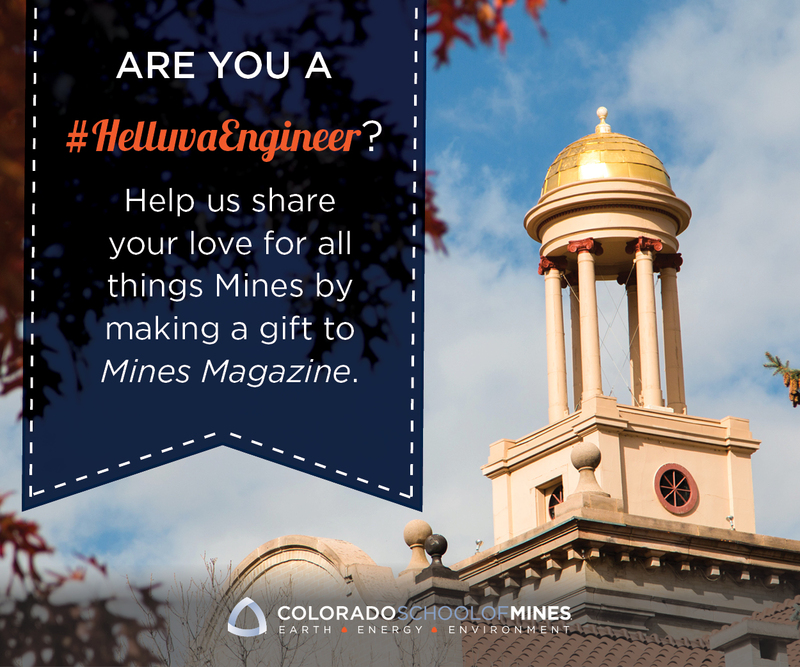 That’s the great thing about the alumni—just the way they’ve impacted Mines. I feel really honored to be in this position, to be the torchbearer so to speak of the great institution and the great alumni that have come before us and the students and alumni that will come after us. Because of the size of the school, I think we have built stronger relationships here. Just recognizing that this is a world-class institution and being able to represent that not only in our professional lives but then taking that into our personal lives. And just the pride of coming through Mines. It’s not an easy school to graduate from, and to have that as a badge of honor is really great. What are your goals for the alumni association in the near future? Communication is very important. 60 percent of the alumni are under the age of 40, and all alumni communicate in different ways. It’s important to me to find out what the best means of communicating to the majority of the alumni is and to get the word out about what is going on at Mines now—the great research that’s going on, the programs that are in place—and then to engage the alumni in terms of time, talent and treasure. We all have time, talent and treasure, so we need to engage on all of those levels, but I found that I personally would become engaged in something if I had an interest in it. That’s what really motivates me—an interest and then seeing results that are tangible and that make a difference. If we can get the word out there to the alumni community of what’s going on at Mines, it might peak an interest in them to where they’d be willing to give back in time and talent to the school. What I’m doing now is building those relationships and network. We do that through the M Clubs, which are important in letting the M Club leadership know what is going on at the school so that information can be disseminated to get that message out to all alumni about different opportunities. The other thing is the special interest groups and the mentoring program. I’ll be working on these four things—communication, M Clubs, interest groups and the mentoring program—for the first year. I think that’s the direction the school and the foundation and the board of directors of the alumni association are looking to go. All those programs are important, bringing together the alumni with the student body and the Mines community in general. To leave a meaningful legacy. To give your time, talent and treasure to something greater than yourself, like so many are already doing. To bene t society and the world in general by doing that. When I came here and interviewed, I gave a presentation and its title was “A Greater Purpose.” I think that’s what we all should look for: something in life that’s bigger than ourselves. And that’s what I encourage alumni to do. Look at Mines: the students and their future; the school and its future; and you as an alumnus and your own future. What are you going to leave as a legacy that will be greater than your individual life? I think family is really important. I also like music; I play piano and guitar. I like to travel. I was volunteer firefighter in Spring, Texas, for five years, so I enjoy learning and the adrenaline rush of doing that. I also took helicopter flying lessons for a while and enjoyed that. Flying, photography, music—the arts outside of engineering.